Order today to manage luggage and more. This is exactly what I was looking for! It took a long time to get here, but it was worth the wait. 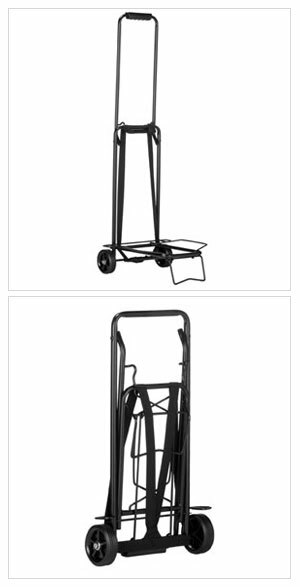 I mainly needed this set hand truck to transport canvas paintings and light weight items. What I liked about this product was that it was versatile, and its design can be used in traveling, but at the same time very hardy. You can put a platform in the bottom made of wood or any other hard surface if you need more space. This product is pretty nifty and handy for what it can do. It is also for a good price because most trucks that sell around here for affordable prices lack quality. I really liked this product! Its not a replacement to use for heavy duty things, but it helps. I have good quality luggage that does not have wheels. Decided to buy this cart so that I could roll my luggage. The cart was sturdy enough for my purpose but still lightweight and rolled smoothly. Was slightly cumbersome to fold up. The cart does not have a lot of places to attach the bungees at the top but it still wound up working fine for my purpose. This is exactly what I was looking for. It is light weight & foldable. I carry a heavy briefcase, sometimes long distances 56 city blocks. I recent had cardiac bypass surgery and am not supposed to lift anything over 10 lbs. 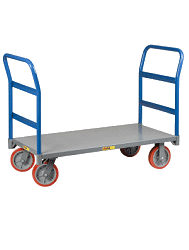 This small Hand Truck allowed me to go back to work without having to worry about lifting & carrying. I use the hand truck to help me carry boxes to presentations. It is the perfect size to carry several boxes. It is also very compact and great for traveling. It folds up even smaller than I thought it would. I am very happy with this purchase and recommend this to others. I needed something light weight to spell my back from carrying heavy books this works well although I use my own straps the handtruck works well.